This delicious Blueberry Poppy Dressing is the perfect match of sweet poppy flavor and ripe, juicy blueberries! We make it from scratch & in small batches so the fresh, homemade flavor makes it to your table. The blueberry poppy dressing is just sweet & tangy enough to make any salad pop with flavor. Add fruits, nuts, greens – you name it. Moms swear by it and say their kids eat more salad with this dressing on top! Substitute for syrup on pancakes, too. Delicious as a creative fish or chicken marinade. 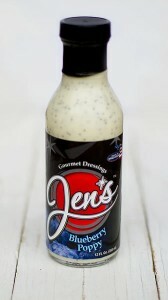 Our blueberry poppy seed salad dressing is a favorite on spinach, almond, blueberry and pear salads – just scrumptious!